1 Feb 2019: Website created. 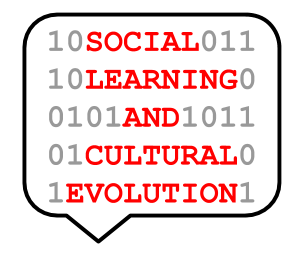 The Fourth International Workshop on Social Learning and Cultural Evolution is a satellite Workshop at the The 2019 Conference on Artificial Life. ALIFE 2019 takes place in Newcastle upon Tyne, England, July 29th to August 8th 2019. We will invite one of the authors of a forthcoming survey of social learning and cultural evolution work in ALife to present their findings. The remainder of the workshop will allow for speakers to present their work, or to bring forward new ideas on the topic of social learning, cultural evolution and social behaviour in ALife. Presenters are encouraged to address any of the following topics (though this list is not exhaustive). We ask potential contributors to submit an extended abstract (500 words). We are open to presenters who are contributing during the main conference to also talk about their work during the workshop in order to have additional discussions. PhD students and young career academics who are new to the field are encouraged to submit to this workshop. The workshop will conclude with a discussion on the grand challenges in the study of social learning and cultural evolution with a focus on how ALife can help address these challenges.